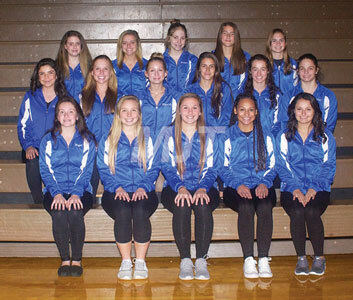 Members of the Lady Monarch gymnastics team are from left, from row, Megan Erickson, Lindsey Itnyre, Lauren Deere, Morgan McKillion and Makayla Tocci; second row, Yasmin Esparza, Brooklyn Heller, Grace Keller, Kaylene Baschnagel, Katelyn Rabe and Mary Calvert; back row, Aleyha Smith, Hannah Scheiderer, Brynn Rychlik, Chloe Baschnagel and Hannah Bates. The Marysville High School gymnastics team has its eye on an Ohio Capital Conference Central Division championship this winter. The Lady Monarchs will be led by a quartet of seniors. They include Lindsey Itnyre (vault, beam, floor exercise), Lauren Deere (vault, beam, floor), Megan Erickson (bars, floor) and Makayla Tocci (vault, beam, floor). Veteran juniors include Mary Calvert (vault, bars, beam, floor), Grace Keller (vault, bars, beam, floor), Katelyn Rabe (bars, beam) and Brooklyn Heller (floor). Hannah Scheiderer (vault, bars, beam, floor) and Brynn Rychlik (vault, bars, beam, floor). Newcomers to the team are freshmen Aleyna Smith and Chloe Baschnagel), juniors Yazmin Esparza and Kaylene Baschnagel and senior Morgan McKillion. “We have five new members and with three solid all-around gymnasts, we will have strength in the beam and floor,” said Calvert.